Additional Info: Veronica Mascaro, Flutist, began her solo career with the Reading Symphony (Pennsylvania, USA) at age 15 and has performed with other local symphonies in the Philadelphia metropolitan area. 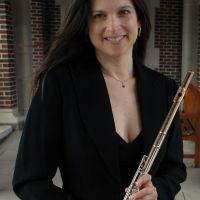 She is a member of the Kennett Symphony Orchestra and freelances in Pennsylvania, New Jersey and New York, adjunct professor of flute and conductor of the Hill Flutes at The Hill School in Pottstown, Pennsylvania and is on faculty at Drexel University. Her teachers include Kenneth Andrews, Robert Stallman, Jeanne Scheneman, Emily Newbold, MIchel Debost, Kathleen Chastain and Joshua Smith. She has participated in master classes in both the US and Europe. IN 2002, Veronica was awarded the Geoffrey Gilbert Performer's Scholarship and in the spring of 2003, along with pianist Kristin Ditlow, released her first solo recording titled "The Mouquet Collection". Veronica performs with the Mascaro-Newman flute and guitar duo and is the founding member of the Flutes de Amore Quartet as well as The PA Flute Troop. She is past winner of the National Flute Associations Professional Flute Choir and beginning in the summer of 2003, began her relationship with the AMEROPA Chamber Music Festival. In addition to many years of private flute and piccolo instruction in The Flute Studio, Veronica has taught through the University of Penn Music 10 Scholarship Program. Through her studio she conducts and coaches chamber ensembles of all ages. These ensembles perform regularly at recitals, community events and master classes in the Philadelphia and Delaware area. In 2001, the Florida Flute Association honored her successful teaching with a teacher's scholarship.